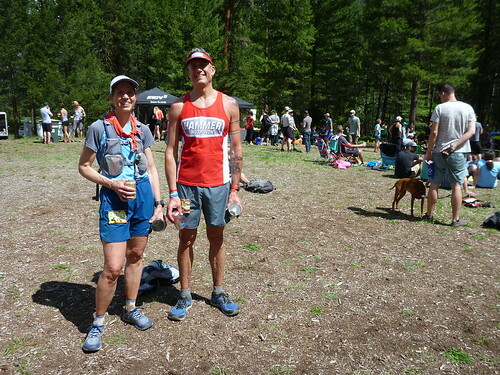 Several months ago my friend Aaron Ostrovsky and I targeted the Sun Mountain 100k as our last qualifying race for UTMB. We both have aspirations about running this event in 2018 and we both needed one more 100k to get enough points to put our names into the lottery. 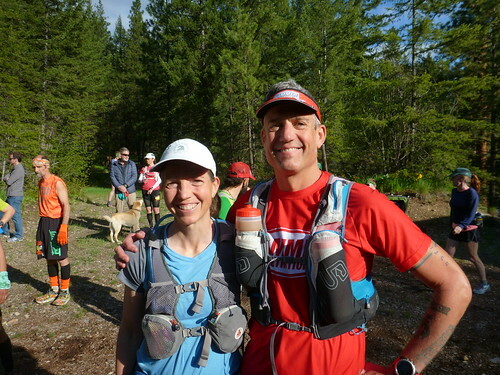 Then - less than one mile from the finish - I fractured my leg at the Orcas Island 50k. In a word, bummer. 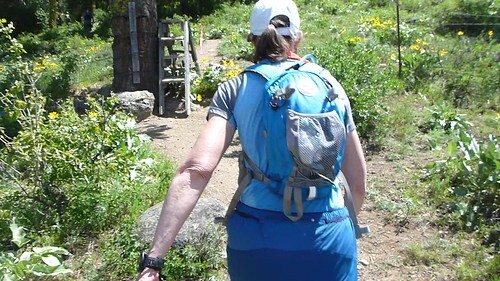 Over the course of the next two months I rested (a lot), continued to eat and drink as if I was running, gained some weight, and fretted like most people do when they attach too much self-worth to a single activity. But after eight weeks I was able to ride my bike. And after 10 weeks I was able to do some stair workouts. And after 12 weeks I was able to run outside. VERY GINGERLY. Luckily for me healing was progressing quickly now. Every two-three days I was feeling a little better. In just two weeks I went from running six miles to a lot more stairs to a couple of two-a-day runs to a 12-mile trail run and then to today. But enough about my leg. Guess who got the same shoes as me? Topo Terraventure baby! 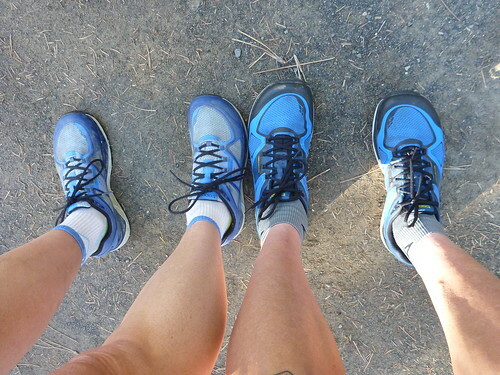 Today was just my second trail run in these shoes and they are the bomb! Tons of protection, super comfy and yet incredibly light. [Did I mention the tongue is gusseted and the laces don't come untied?] I was tailgating Lucca like crazy for some reason today and so in addition to almost giving her a flat about one dozen times I also regularly didn't see obstacles in the trail until it was too late. After stubbing my toes no less than four times I can say that these shoes do a great of protecting your feet. 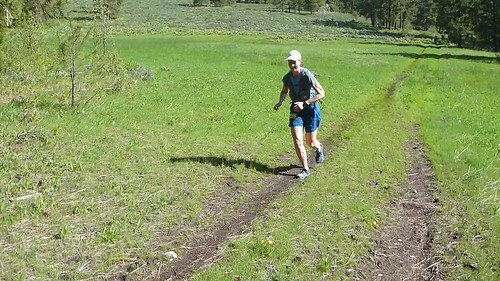 I have found my new favorite every day and ultra trail shoe. Last week was wet. Not today. 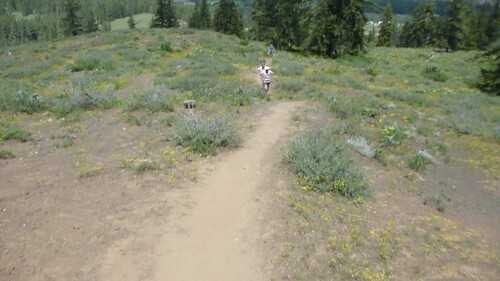 But the clouds hung around just long enough to insulate the Methow Valley and trap some of the heat overnight and most people started the run in exactly the same outfit that they finished in. The trails up here were lush! Nothing has dried out yet AND it wasn't muddy. We ran through fields of green. We even had to climb one ladder. Going in I had read that you could drop at any aid station. Looking at the route map there were also two spots that we very close to the finish so I decided to run with Lucca and see how far I got. Aid station #1 came at mile 8.6, I figured that would be no problem and I was right. Aid station #2 was at mile 17. The trails were a dream so far and this distance was also not a problem. 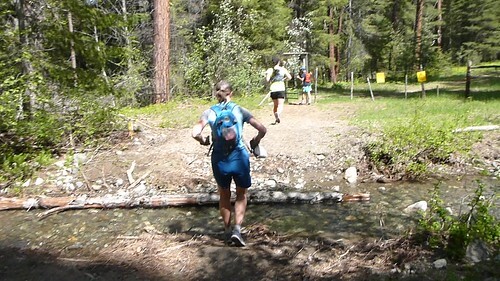 Aid station #3 was at mile 25.2. By now my back was pretty tired (in an effort to get fit fast I had neglected my core work in favor of endurance activities) but my leg felt great! Onward! To Lucca's credit we ran most of the last two-mile climb (she ran most of EVERY climb) and when we crossed the finish line I was on top of the world. I'll say it again, success usually depends on several things. Pace - this run was a test to see what kind of distance my leg could tolerate. Turns out Lucca's pace was perfect to let me achieve this new milestone. And she is so strong and consistent. Thank you Lucca! Weather - what can I say? My short sleeve shirt lasted exactly 1.9 miles and then I ran in my singlet all the way to the finish. And it never got too hot. Nice! 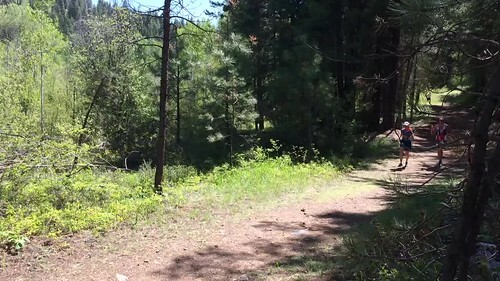 As Lucca and I approached the finish, I was so focused on filming her that I totally missed this little girl by the side of the trail. I heard after the fact that she was waiting for her father to arrive and was so amped up and full of spirit that she was high-fiving everyone that ran past. Except for me, I totally dissed her. :( Fortunately Bil (Lucca's husband) captured it all. 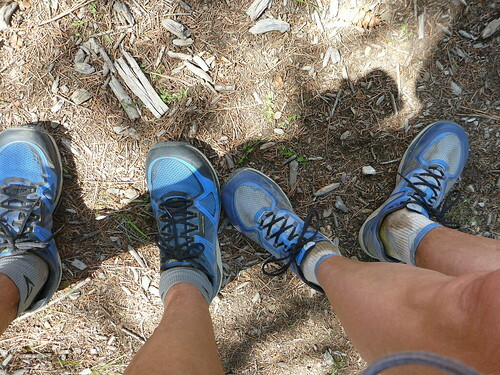 And this is what our Topo Terraventure shoes looked like after 50 km. It was also fun to see some friends. 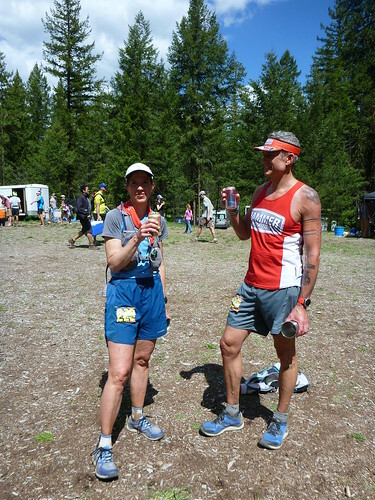 Not only did Aaron finish the 100k in a great time, I also saw Thomas Frizelle, Sim Ashworth and Gavin Woody. Good stuff.